When you open the Book of Daniel or the Book of Revelation and read them, there's absolutely no question that the stage is the ancient land of Israel, with the capital of Jerusalem. All the scenarios absolutely center on this, if read literally. ... When fundamentalist Christians read the Bible in the 20th century, something has been fundamentally changed, just in the last 50 years in particular. And that is, they're able to open texts for the first time in 2,000 years--texts like Revelation, texts like the Book of Daniel, all the prophets--and they can begin to see the possibilities of a literal fulfillment, not a symbolic fulfillment as in the past. That is, Jerusalem would mean Jerusalem. The Jewish people would mean literally the Zionists and the Jewish state that now exists. ... In June 1967, at the conclusion of the Six Day War, the Israelis found themselves, for the first time in 2,000 years, in control of the Old City of Jerusalem. Jews could go to the wall and pray. There was this euphoric sense of victory and even survival after this war, from just a Jewish point of view, from an Israeli point of view. Christians, however, who were fundamentalist interpreters of the Bible, had a completely different take on this. It's quite interesting. Not only did they laud and applaud the Jewish sovereignty, but they understood this as the beginning of the end, as a potential fulfillment of Bible prophecy, because in fact every scenario that you can read about in the prophets, from the Book of Revelation back to the Book of Daniel, implies that in the last days Jerusalem would be ruled and controlled not by Turks, not by British, not by all the various cultures that have controlled Jerusalem for the centuries, but by, in fact, a sovereign Jewish population. And so in fact, this was true again. Now, the big event that these interpreters were waiting for would be the rebuilding of the Temple, the so-called Third Temple. One of the strangest and most unusual symbiotic relationships that has developed from the Six Day War is that fundamentalist Jews and fundamentalist Christians have something in common. You would not expect this to happen. But after 1967, with Israeli control over the holy places, and the Temple Mount in particular, here we have a double interest. On the one hand, we have fundamentalist Jews who believe that the destiny and future of Judaism and of the Jewish people is the rebuilding of the Temple up where the Dome of the Rock is, where the mosque is. Now, why would Christians be interested in this? Traditionally, Christians have had no interest in the Jewish Temple. And this is what we've seen develop just in our time. When Christians read the Book of Revelation, they read about a figure coming into Jerusalem from the outside and occupying Jerusalem, and in fact, sitting in a temple of God, claiming to be God, stopping the Jewish sacrifices. And so it's a simple matter of literal reasoning. If in fact the world is going to end, if Jesus is going to come back, if these things are going to happen, we have to have a temple. And so we have Christians interested in seeing that the Temple is built, in some cases even willing to raise funds and even pay for this to be built. Gershon Solomon, who is one of the most vocal advocates of rebuilding the Temple, does much of his speaking not at synagogues, when he comes to the United States, but in Christian churches. He draws thousands of people that want to hear the latest news about the potential rebuilding of the Temple on the Temple Mount. And so it is one of the strangest things, I think, that we've seen develop in our own lifetime. For more on the Third Temple movement and the relationship between Christian prophecy believers and Israel, read Lawrence Wright's New Yorker article "Forcing the End," and "How Christian Evangelicals Became Israel's Best Friend" from Christianity Today. One of the prerequisites for building this Third Temple is not only Israeli sovereignty over the city of Jerusalem, as we've seen since 1967, but a very strange rite in the Hebrew Bible, the Book of Numbers, where a red heifer is to be produced and then sacrificed and burnt into ashes. And these ashes are used to purify, mixed with water. Until this is done, the Orthodox rabbis in Jerusalem will tell you, there can be no Third Temple. Now, you would expect this to be a very Jewish kind of an affair. What do rabbis know about cattle raising? In fact, we've had reports in Israel of Israelis raising cattle, trying to produce this red heifer. "Red heifer" refers to the idea that this heifer would have a reddish color with not a single black hair or any other color anywhere on its complete body. But one of the oddest things that has developed is that Christian fundamentalists here in the United States, such as Clyde Lott from Mississippi, who is a cattle man, has got into this as well. He believes that his calling and his destiny is to cooperate with the Jewish people and perhaps even give them a gift of one of these red heifers. And so here we have a very specific example of how one form of religion, Orthodox Judaism, which would have nothing to do with fundamentalist Christianity, or vice versa, are cooperating together in the city of Jerusalem to fulfill what both consider to be an apocalyptic vision of the end and of the future. This matter of making any move or attempt to actually build the Third Temple is obviously extremely volatile. In the early nineties, the movement led by Gershon Solomon had prepared a cornerstone. They literally brought it in on a pickup truck, and were going to wheel it up and try to take it up to the Temple Mount, and at least symbolically lay the cornerstone of the Temple. I don't know that they even thought that they would really succeed, but they wanted to make this move. The Muslims up around the Dome and the Mosque got word of that the Jews are coming and they plan to lay the cornerstone of the Temple, and complete chaos broke out. Rocks were thrown down, bricks, large stones on the Jewish people praying down below at the western wall. The police reacted to that by sending up Israeli troops to try to quell the rioting. People were running about and screaming and yelling, and several people were shot and even killed, simply over the rumor that something like this might happen. ... Every year since the early 1990s, Gershon Solomon and his Temple Mount Faithful followers have attempted to march up onto the Temple Mount and pray, and if possible, even to bring a cornerstone that they prepared, a huge rock that's cut, to lay the foundation of the Third Temple. And each year, they get stopped and they're turned away. And they simply try again the next year. They have tremendous Christian support among those interpreters of the Book of Revelation that in fact some day believe that such a temple will be built. So maybe this is what God is going to use. Here are some Jews who want to build it. Here's the text that says it will be built. It has to be built in order for Jesus to return. All of these things have to be fulfilled. So their understanding is: Who's to say who will actually play a part in bringing about this inevitable scenario of events that will usher in the end? Landes teaches history at Boston University and is a Director and co-founder of the Center for Millennial Studies. The year 2000 in Jerusalem for millennial scholars is what the Galapagos was for Darwin. We're gonna see all sorts of fauna and flora, and not just the sort of traditional stuff like, like Christian pre-millennial fundamentalists who come here because they think Jesus is gonna come down. There are already some people on the Mount of Olives who are there waiting. As one of them put it to me,"If you go in a building you want to get to the top floor, you stand in front of the elevator. Well, this is the elevator to heaven." One of the Christian beliefs--and we see this in the year 1000--is that Jesus went up from the Mount of Olives and that's where he'll come down. 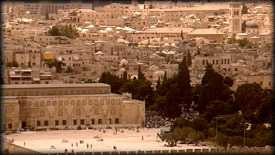 So when you think the end of the world is coming, the Mount of Olives is the place you want to be, if you're a Christian. But we're gonna see all sorts of New Age types, we have UFO groups who believe that the aliens are gonna land in Jerusalem, that they have to build an embassy for them in Jerusalem and so on ... .
Are some of these fringe groups potentially dangerous? The authorities in Jerusalem actually want to know whether they should be alarmed or concerned. They're certainly aware, they're alert to it, they've been attending conferences in which these kinds of things are discussed. Whether they figured out exactly how to deal with it, is another question. There's a tremendously thin line that has to be walked here between religious freedom on the one hand, and keeping track of the possibility of a group going toxic. ... And of course you know this is the first time in the history of Christianity, that you've had a great moment like this. A millennial moment, when the Jews have sovereignty over Jerusalem, this is total anomalous situation. Right now most of the apocalyptic enthusiasts in Christianity, at least the ones who are interested in Israel, are philo-Judaic, but, if we get disappointment, if we get bitterness, if they turn and blame the secular Israeli government for all sorts of things, if there's a peace accord that gives some of Jerusalem back, all of those things can turn the tide and things can get, shall we say, unpleasant.